Hens are notoriously difficult to diagnose; as a predated species they hide illness until it is often too late. The easiest way to identify something is wrong is to observe your hens closely each day and make a point of checking your hens often so you know what a healthy hen looks and feels like. That way you will know when something is wrong, long before your hen tries to tell you! Crop should be empty in the morning and full at night, when it should feel like one of those rice-filled stress balls - firm but not hard and yielding to gentle pressure but not squishy. Abdomen should be firm but not hot, swollen or squishy. Knickers and vent are clean. Vent is pulsating normally (imagine an aged aunt pursing her lips over an unwanted swearword). Eyes and nose are clear. She is alert and her tail is up. She is eating and drinking normally. She is active – foraging, dust-bathing, preening and, if she is dozing in the sunshine, she is looking relaxed and happy. 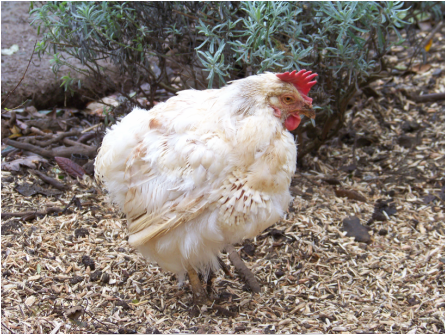 Once you are familiar with how your hens behave when they are well, it becomes much easier to identify when they are ill.
A hunched stance and her tail down. Her wings trailing a little (imagine that droopy feeling you get when you feel ill). Lack of interest in her surroundings. She may stay in the coop, or stand in a corner, facing inwards. Any of these signs could indicate something is not right, so give your hen the once over. closely and refer to the Sick Hen Checklist.